New Balance reveals fierce Russian- inspired Otruska Pack. Designed with key callouts to Russia, which will play host to the world’s biggest footballing event this year, the Otruska Pack is inspired by the mythical two-headed hellhound, Orthus, it represents attack in dual form, ferocity and deception. The Otruska Pack features a refreshed 574 Sport and stylish Fresh Foam Cruz v2 Sportlifestyle shoes, all in a striking White with Flame Red detail. 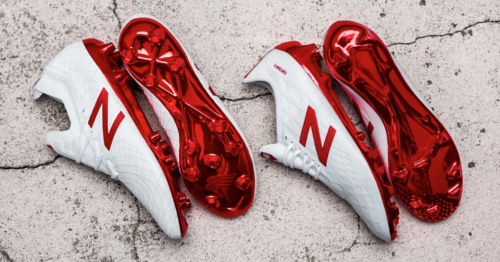 In addition to the stunning lifestyle designs, fans are given a first glimpse of New Balance Football’s new boot, Tekela, in addition to the upgraded Furon 4.0 boot. The New Balance 574 Sport (S$169) in the Otruska Pack integrates classic running style and its modern Fresh Foam cushioning technology for maximum comfort. The stylish kicks features a deconstructed take on the 574, eliminating clutter for a fresh style. Designed to provide maximized comfort while on the run, the enhanced Fresh Foam Cruz v2 Sport (S$139) is set to redefine your style with a tech-minded, 2-way stretch upper, plus a comfortable bootie construction with rubberized heel for easy on/off. Engineered with full foot microfibre upper, the Tekela (S$279) features dynamic kinetic stitch embroidered bands, designed for the innovators who use speed and manoeuvrability to change the outcome of games. Featuring a TPU with inlayed nylon chassis on the outsole, the lightweight Tekela kicks offers enhanced agility and provides exceptional stability to wearers, allowing them to be fearlessly creative going forward. Furon 4.0 (S$279) from the Otruska Pack meanwhile, is engineered for speed, acceleration and accuracy; made for attackers who finish without mercy. Using FantomFit technology and Hidraskin touch membrane, with an enlarged cleanlace contact zone, Furon 4.0 allows for a clean, precise strike in front of goal – clinical and lethal. For more information, visit www.newbalance.com.sg or follow @newbalancesg on Instagram and @newbalance.sg on Facebook.